Having all of the prices and costs listed out is good, but it’s not very usable for updating the costs when the values are related. To make the template more useful, we will use the Matrix Fields options within the Dynamics AX Add-In for Excel to create summary price fields that we can update in a tabular format. 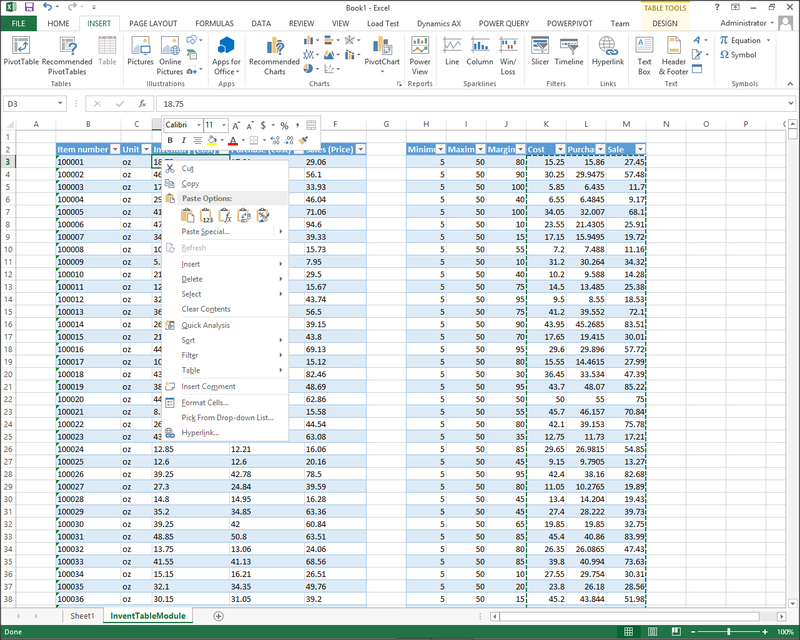 NOTE: This is part of the Creating an Excel template for Updating Product Costs and Prices blog series where we show how to create a template within Excel to update product costs and prices. If you want to see all of the other posts in this series, click here. The easiest way by far to update Dynamics AX in mass is to use the Dynamics AX Add-In for Excel. Creating a template that you can use for the updates is a really simple process and just takes a minute or so. Everyone uses Excel to prepare information for updates within Dynamics AX because it gives you a little bit more freedom as you are massaging the data. If you have the Dynamics AX Add-In for Excel installed on your computer then you don’t even have to key in the data once you have created it because you can create an Excel template that securely updates Dynamics AX from Excel. In this example we will show how you can use the Dynamics AX Add-In for Excel to create a template for updating product costs and prices, which you can use for mass updates, or quick changes to the pricing without even having to touch the Dynamics AX client.